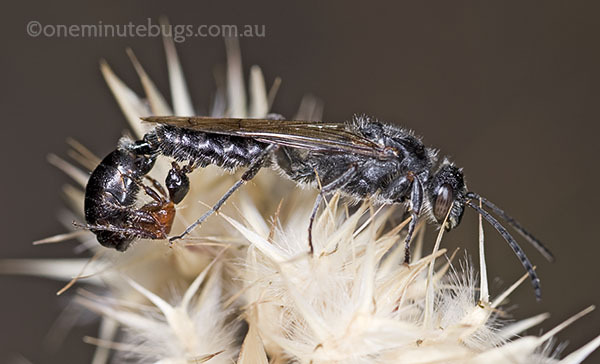 The image above shows neither an ‘ant’ nor a ‘fly’ — but a mating pair of wasps of the family Tiphiidae, often referred to as ‘flower wasps’. The wasp with the wings is the male, and the upside down one is the female. The “attack of the ovipositor” is simply the female gripping the abdomen of the male with her jaws and curling her abdomen upwards so their genitalia can meet. However I have seen mating pairs get this wrong, and the female ends up gripping the male’s genitalia with her powerful jaws (I resist the urge to draw painful sounding human analogies here), and the male has to spend a considerable amount of time trying to flick her off. Because female flower wasps are wingless they rely on males to carry them to a food source (flower nectar) while mating. All this flying around while mating means the wasps stay in a coupled position for a prolonged period of time. To facilitate this, both sexes have evolved unusually shaped genitalia that include spines, grooves and other structures, so that they don’t accidentally disengage. But why go to all this trouble? Why don’t the females have wings? Some female flower wasps are parasites of beetle larvae and mole crickets located underground. Winglessness allows females to dig underground and hunt for prey without risking delicate wings. This probably sounds exotic and unusual, but wasps of the family Tiphiidae are common in Australia, in fact we have about 700 native species. But you ain’t seen nothing yet. Some insects are described as exhibiting ‘a high degree of sexual dimorphism’ or ‘extreme sexual dimorphism’. 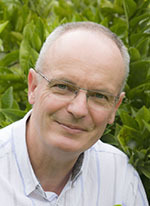 Callipappus spp. 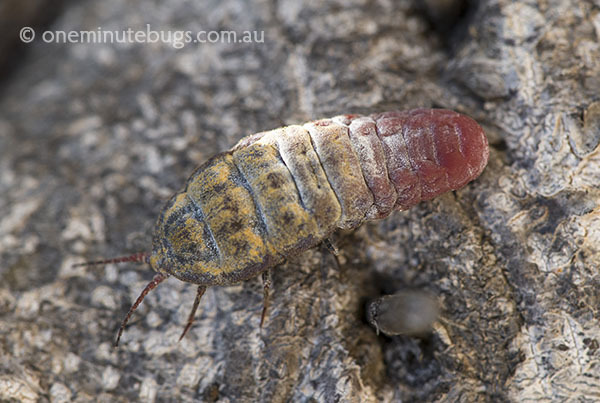 in the ‘bug’ superfamily Coccoidea (which includes the scale insects and the mealybugs) is a good example. 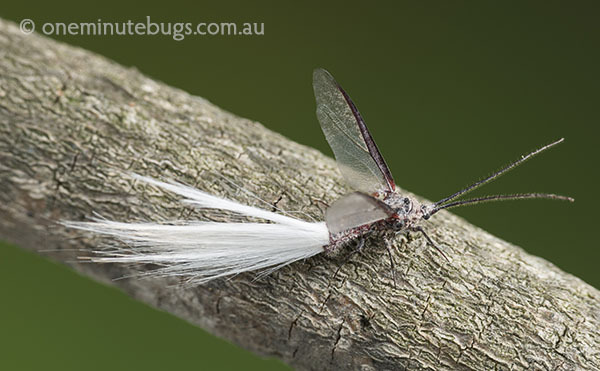 Males (commonly known as bird-of-paradise-flies) are beautiful winged insects about 10mm long with tails of glass-like filaments (above), and females are lumbering wingless mealybug-like insects about 40mm long (below). A mating pair of Callipappus looks rather incongruous — a bit like a peacock pairing up with a hippo. This entry was posted in Coccoidea, story, Tiphiidae and tagged bird of paradise, Callipappus, giant mealybug, Thynninae by denisjc. Bookmark the permalink.